The last year or two I have made a point to always bring my own healthy options to our family potlucks. That way I know I will have a healthy option that I can fill my plate up if nothing else fits into my diet. I have really enjoyed having the Handi Foil pans. If I need I can bake up my dish, take it to the potluck, and don’t have to worry about taking anything home. Or I can even give the food to someone else, like my neighbors who just had a baby and there are no worries about dishes, for them or for me. This broccoli dish is a healthy version of cheesy saucy broccoli. Plus I like it even more because the broccoli and the cheese have more of a crispy texture not a mushy texture! If you are not a fan of lemon pepper or don’t have any in your pantry, try another spice. I love chili powder and cumin, they have a bit more bite, but still amazing. 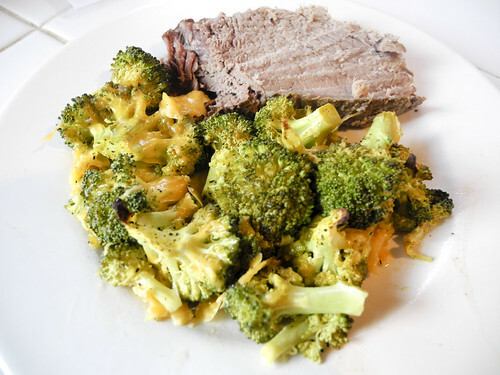 Place broccoli in a freezer bag and lemon pepper. Toss well to coat. 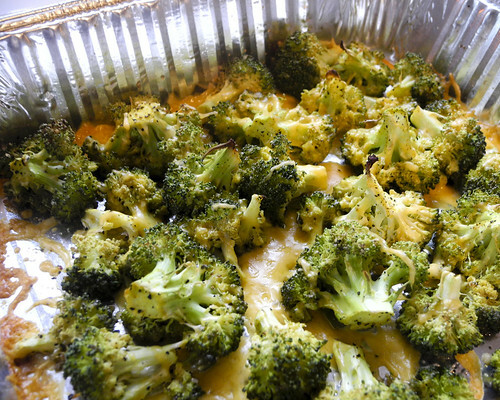 Spread broccoli on prepared baking sheet and bake 15 minutes. Spread cheese over broccoli and put back in oven for an additional 5 minutes. The ingredients are great. Lemon with pepper broccoli sounds quite interesting. i have never tried cheese with broccoli. Seems to me that the nutrition value is great here. going to try this one. Thanks a lot for the healthy recipe.